30 Euston Square, just a minute from Euston Station, is a spectacular central London venue for any corporate event. An incredibly vibrant, flexible and unique venue, 30 Euston Square has a variety of different spaces to suite your needs. The Auditorium and Exhibition provide clients with a self-contained space for up to 300. The auditorium benefits from state-of-the-art AV technology and is complimented by the self-contained exhibition space which acts as the perfect networking area. The Heritage Rooms, a suite of six grade II* listed rooms, offer exceptional spaces to create corporate events from conferences to private dining. Princes Gate can host 24 seated at a boardroom table, and the four smaller rooms cater for between 8-18. The State Rooms and Rooftop Terrace are flexible spaces, at their largest they can cater for 230 standing, 140 theatre style or 160 seated for a dinner, however, it is also possible to separate the spaces. The Rooftop Terrace with wooden decking, a capacity of 90, comfortable seating and built- in AV make it an amazing outside area for any event. 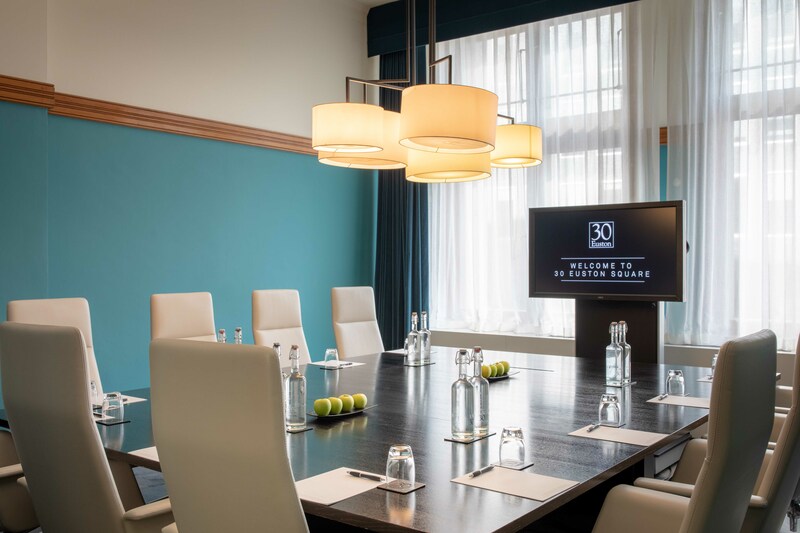 The 18 ground-floor meeting rooms range from a boardroom meeting room for six, a training room for 50 cabaret style to a seminar room for 80 people theatre style. The in-house chefs have designed creative, innovative dishes to keep delegates feeling energised throughout their time at 30 Euston Square. For an exciting addition to your corporate party our chefs have created street-food stations which provide an interactive catering option. The experienced Events and Operations teams at 30 Euston Square are always on hand to provide advice on the best layout, AV guidance and menu planning to help enhance your event experience.